Igor Fyodorovich Stravinsky (Russian language|Russian: Игорь Фёдорович Стравинский, Igor' Fëdorovič Stravinskij) (born June 17, 1882, Oranienbaum (in the Soviet times Lomonosov) near Saint Petersburg, Russia; died April 6, 1971, New York City) was a Russia|Russian-born composer. Although he composed primitivist, neo-classical and serial works, he is best known for three compositions from his earlier, Russian period: L'Oiseau de feu ("The Firebird") (1910), Petrushka (1911), and Le sacre du printemps ("The Rite of Spring") (1913). These daring and innovative ballets practically reinvented the genre. Stravinsky also wrote for a wide range of ensembles in a broad spectrum of classical forms, ranging from opera and symphonies to piano miniatures and works for jazz band to the powerful spirituality of works like the Symphony of Psalms and the Mass. In his long career, there was scarcely a musical form that Stravinsky did not turn his hand to. Stravinsky also achieved fame as a pianist and conductor, often at the premieres of his own works. He was also a writer; with the help of Alexis Roland-Manuel, Stravinsky compiled a theoretical work entitled Poetics of Music in which he famously claimed that music was incapable of "expressing anything but itself." Several interviews in which the composer spoke to Robert Craft, a musicologist, conductor and later confidant, were published as Conversations with Stravinsky. They collaborated on five further volumes over the following decade. Though Igor Stravinsky may not have been seen, at least outwardly, as an individual of strong religious convictions (like Olivier Messiaen), he nonetheless professed a belief in God as source of eternal verities. In an interview late in his life he remarked, "The more one separates oneself from the canons of the Christian Church, the further one distances himself from the truth…. Art is made of itself, and one cannot create upon a creation, even though we are ourselves graftings of Jesus Christ." On the importance of religious conviction and composing he once asserted that it wasn't enough to merely believe in "symbolic figures, but in the person of the Lord, the person of the Devil, and the miracles of the church." Upon writing his three movement Symphony of Psalms, the composer explained that the first movement "was written in a state of religious and musical ebullience." Though Stravinsky once asserted that music was essentially powerless to express anything, he nevertheless believed in the expressive nature of music. Commenting on the introduction of his ballet, The Rite of Spring, he explained that he wished, "to express the sublime uprising of Nature renewing itself… the obscure and immense sensation of which all things are conscious when Nature renews its forms, it is the vague and profound uneasiness of a universal puberty." A quintessential Russian, Stravinsky was one of the most influential composers and artists of 20th century music, both in the West and in his native land. He was named by TIME Magazine as one of the most influential people of the century. He was brought up in Saint Petersburg and dominated by his father and elder brother; Stravinsky's early childhood was a mix of experience that hinted little at the cosmopolitan artist he was to become. Although his father Fyodor Stravinsky was a bass singer at the Mariinsky Theater in Saint Petersburg, Stravinsky originally studied to be a lawyer. He switched to composition later. Stravinsky met Rimsky-Korsakov's son, and his interest in composition grew as he spent more time composing on his own. Up till then, he had taken private lessons in harmony, and he intended to enter the Russian Conservatory. It was at this time that he brought his works before Rimsky-Korsakov, head of the Conservatory. Sensing the talent in the young man, Rimsky-Korsakov invited Stravinsky to take private lessons from himself. Stravinsky was delighted and readily accepted. In 1902, at the age of 20, Stravinsky became the pupil of Nikolai Rimsky-Korsakov, probably the leading Russian composer of the time. Rimsky-Korsakov had arranged for his students to perform their works. Stravinsky chose to exhibit Feu d'artifice (Fireworks). His music sparked the interest of Sergei Diaghilev, who was impressed enough to commission Stravinsky, first for orchestrations, and then for a full-length ballet score, L'Oiseau de feu (The Firebird). He moved to neutral Switzerland in 1914, because of World War I, but returned to Paris in 1920 to write more ballets, as well as many other works. Stravinsky displayed an inexhaustible desire to learn and explore art, literature, and life. This desire manifested itself in several of his Paris collaborations. Not only was he the principal composer for Sergei Diaghilev's Ballets Russes, but he also collaborated with Pablo Picasso (Pulcinella, 1920), Jean Cocteau (Oedipus Rex, 1927) and George Balanchine (Apollon Musagete, 1928). 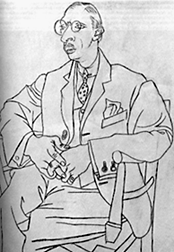 Stravinsky by Picasso. Pablo Picasso collaborated on Pulcinella in 1920. Picasso took the opportunity to make several sketches of the composer. Relatively short of stature and not conventionally handsome, Stravinsky was nevertheless photogenic, as many pictures show. He was still young when, on January 23, 1906, he married his cousin Katerina Nossenko whom he had known since early childhood. Their marriage endured for 33 years, but the true love of his life, and later his partner until his death, was his second wife Vera de Bosset (1888-1982). Although a notorious philanderer (even rumoured to have affairs with high-class partners such as Coco Chanel), Stravinsky was also a family man who devoted considerable amounts of his time and expenditure to his sons and daughters. One of his sons, Soulima Stravinsky, was also a composer, but is little known compared to his father. When Stravinsky met Vera in the early 1920s, she was married to the painter and stage designer Serge Sudeikin, but they soon began an affair which led to her leaving her husband. From then until Katerina's death from cancer in 1939, Stravinsky led a double life, spending some of his time with his first family and the rest with Vera. Katerina soon learned of the relationship and accepted it as inevitable and permanent. After her death, Stravinsky and Vera were married in New York where they had gone from France to escape the war in 1940. Patronage too was never far away. In the early 1920s, Leopold Stokowski was able to give Stravinsky regular support through a pseudonymous "benefactor." The composer was also able to attract commissions: most of his work from The Firebird onwards was written for specific occasions and paid for generously. He moved to the United States in 1939 and became a naturalized citizen in 1945. He continued to live in the United States until his death in 1971. Stravinsky had adapted to life in France, but moving to America at the age of 58 was a very different prospect. For a time, he preserved a ring of emigré Russian friends and contacts, but eventually realized that this would not sustain his intellectual and professional life in the USA. When he planned to write an opera with W. H. Auden, the need to acquire more familiarity with the English-speaking world coincided with his meeting the conductor and musicologist Robert Craft. Craft lived with Stravinsky until his death, acting as interpreter, chronicler, assistant conductor and 'factotum' for countless musical and social tasks. Another well-known musician that was constantly his understudy was Warren Zevon who was a regular visitor to Stravinsky's home where he, along with Robert Craft, would study music. Stravinsky proved adept at playing the part of "man of the world," acquiring a keen instinct for business matters and appearing relaxed and comfortable in many of the world's major cities. Paris, Venice, Berlin, London and New York all hosted successful appearances as pianist and conductor. Most people who knew him through dealings connected with performances spoke of him as polite, courteous and helpful. For example, Otto Klemperer said that he always found Stravinsky much more co-operative and easier to deal with than Arnold Schoenberg,another well known composer. At the same time, he had a marked disregard for those he perceived to be his social inferiors. Stravinsky's taste in literature was wide, and reflected his constant desire for new discoveries. The texts and literary sources for his work began with a period of interest in Russian folklore, progressed to classical authors and the Roman Rite Latin liturgy, and moved on to contemporary France (André Gide, in Persephone) and eventually English literature, including Auden, T.S. Eliot and medieval English verse. At the end of his life, he was even setting Hebrew scripture in Abraham and Isaac. In 1962, he accepted an invitation to return to Russia for a series of concerts, but remained an émigré firmly based in the West. He died at the age of 88 and was buried in Venice on the cemetery island of San Michele. 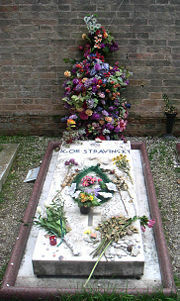 His grave is close to the tomb of his long-time collaborator Diaghilev. Stravinsky's life had encompassed most of the twentieth century, including many of its modern classical music styles, and he influenced composers both during and after his lifetime. He has a star on the Hollywood Walk of Fame at 6340 Hollywood Boulevard. The first of the ballets, L'Oiseau de feu, is notable for its unusual introduction (triplets in the low basses) and sweeping orchestration. Petrushka, too, is distinctively scored and the first of Stravinsky's ballets to draw on folk mythology. But it is the third ballet, The Rite of Spring, that is generally considered the apotheosis of Stravinsky's "Russian Period." Here, the composer draws on the brutalism of pagan Russia, reflecting these sentiments in roughly-drawn, stinging motifs that appear throughout the work. There are several famous passages in the work, but two are of particular note: the opening theme played on a bassoon with notes at the very top of its register, almost out of range; and the thumping, off-kilter eighth-note motif played by strings and accented by horn on off-rhythms (See Le sacre du printemps (The Rite of Spring) for a more detailed account of this work). Other pieces from this period include: Renard (1916), Histoire du soldat (A Soldier's Tale) (1918), and Les Noces (The Wedding) (1923). The next phase of Stravinsky's compositional style, slightly overlapping the first, is marked by two works: Pulcinella 1920 and the Octet (1923) for wind instruments. Both of these works feature what was to become a hallmark of this period; that is, Stravinsky's return, or "looking back," to the classical music of Wolfgang Amadeus Mozart and Johann Sebastian Bach and their contemporaries. This "neo-classical" style involved the abandonment of the large orchestras demanded by the ballets. In these new works, written roughly between 1920 and 1950, Stravinsky turns largely to wind instruments, the piano, and choral and chamber works. The Symphonies of Wind Instruments and Symphony of Psalms are among the finest works ever composed for winds. Other works such as Oedipus Rex (1927), Apollon Musagete (1928) and the Concerto in E-flat (Dumbarton Oaks concerto) continue this trend. Some larger works from this period are the three symphonies: the Symphonie des Psaumes (Symphony of Psalms) (1930), Symphony in C (1940) and Symphony in Three Movements (1945). Apollon, Persephone (1933) and Orpheus (1947) also mark Stravinsky's concern, during this period, of not only returning to Classic music but also returning to Classic themes: in these instances, the mythology of the ancient Greeks. The pinnacle of this period is the opera The Rake's Progress. It was completed in 1951 and, after stagings by the Metropolitan Opera in 1953, was almost ignored. It was presented by the Santa Fe Opera in its first season in 1957 with Stravinsky in attendance, the beginning of his long association with the company. This opera, written to a libretto by W. H. Auden|Auden and based on the etchings of William Hogarth, encapsulates everything that Stravinsky had perfected in the previous 20 years of his neo-classic period. The music is direct but quirky; it borrows from classic tonal harmony but also interjects surprising dissonances; it features Stravinsky's trademark off-rhythms; and it hearkens back to the operas and themes of Claudio Monteverdi, Christoph Willibald Gluck and Mozart. After the opera's completion, Stravinsky never wrote another neo-classic work but instead began writing the music that came to define his final stylistic change. Only after the death of Arnold Schoenberg in 1951 did Stravinsky begin using dodecaphony, the twelve-tone system which Schoenberg had devised, in his works. Stravinsky was aided in his understanding of, or even conversion to, the twelve-tone method by his confidant and colleague, Robert Craft, who had long been advocating the change. The next fifteen years were spent writing the works in this style. Stravinsky first began to experiment with the twelve-tone technique in smaller vocal works such as the Cantata (1952), Three Songs from Shakespeare (1953) and In Memoriam Dylan Thomas (1954). Canticum Sacrum (1955) is his first piece to contain a movement entirely based on a tone row. He later began expanding his use of dodecaphony in works often based on biblical texts, such as Threni (1958), A Sermon, a Narrative, and a Prayer (1961), and The Flood (1962). An important transitional composition of this period of Stravinsky's work was a return to the ballet: Agon, a work for 12 dancers written from 1954 to 1957. Some numbers of Agon recollect the "white-note" tonality of the neo-classic period, while others (the Bransle Gay) display his unique re-interpretation of serial method. The ballet is thus like miniature encyclopedia of Stravinsky, containing many of the signatures to be found throughout his compositions, whether primitivist, neo-classic, or serial: rhythmic quirkiness and experimentation, harmonic ingenuity, and a deft ear for masterly orchestration. These characteristics are what make Stravinsky's work unique when compared with the work of contemporaneous serial composers. Stravinsky's work embraced multiple compositional styles, revolutionized orchestration, spanned several genres, practically reinvented ballet form and incorporated multiple cultures, languages and literatures. As a consequence, his influence on composers both during his lifetime and after his death was, and remains, considerable. Motivic development, that is using a distinct musical phrase that is subsequently altered and developed throughout a piece of music, has its roots in the sonata form of Mozart's age. The first great innovator in this method was Ludwig van Beethoven; the famous "fate motif" which opens Beethoven's Fifth Symphony and re-appears throughout the work in surprising and refreshing permutations is a classic example. However, Stravinsky's use of motivic development was unique in the way he permutated his motifs. In the "Rite of Spring" he introduces additive permutations, that is, subtracting or adding a note to a motif without regard to changes in meter. The same ballet is also notable for its relentless use of ostinati. The most famous passage, as noted above, is the eighth note ostinato of the strings accented by eight horn that occurs in the section Auguries of Spring (Dances of the Young Girls). This is perhaps the first instance in music of extended ostinato which is neither used for variation nor for accompaniment of melody. At various other times in the work Stravinsky also pits several ostinati against one another without regard to harmony or tempo, creating a 'pastiche', a sort of musical equivalent of a Cubist painting. These passages are notable not only for this pastiche-quality but also for their length: Stravinsky treats them as whole and complete musical sections. Such techniques foreshadowed by several decades the minimalist works of composers such as Terry Riley and Steve Reich. Stravinsky was not the first practitioner of the Neoclassical style; in fact the German composer Richard Strauss might be its first and greatest example (he composed the Mozartian Der Rosenkavalier in 1910, as Stravinsky was just beginning the works of his Russian period). Others, such as Max Reger, were composing in the manner of Bach long before Stravinsky, but certainly the latter is a brilliant Neo-classical musician. The Neoclassical style would be later adopted by composers as diverse as Darius Milhaud and Aaron Copland. Sergei Prokofiev once chided Stravinsky for his Neoclassical mannerisms, though sympathetically, as Prokofiev had broken similar musical ground in his Symphony No. 1 "Classical" of 1916-1917. Stravinsky announced his new style in 1923 with the stripped-down and delicately scored Octet for winds. The clear harmonies, looking back to the Classical music era of Mozart and Bach, and the simpler combinations of rhythm and melody were a direct response to the complexities of the Second Viennese School. Stravinsky may have been preceded in these devices by earlier composers such as Erik Satie, but no doubt when Aaron Copland was composing his Appalachian Spring ballet he was taking Stravinsky as his model. Certainly by the late 1920s and 1930s, Neoclassicism as an accepted modern genre was prevalent throughout art music circles around the world. Ironically, it was Stravinsky himself who announced the death of Neoclassicism, at least in his own work if not for the world, with the completion of his opera The Rake's Progress in 1951. A sort of final statement for the style, the opera was largely ridiculed as too "backward looking" even by those who had lauded the new style only three decades earlier. While the use of musical quotation was by no means new, Stravinsky composed pieces which distort individual works by earlier composers. An early example of this is his Pulcinella of 1920, in which he used the music of Giovanni Pergolesi as source material, at times quoting it directly and at other times reinventing it. He developed the technique further in the ballet The Fairy's Kiss of 1928, based on the music—mostly piano pieces—of Pyotr Ilyich Tchaikovsky. Later examples of distorted quotation include Stravinsky's use of Schubert in Circus Polka (1942) and "Happy Birthday to You" in Greeting Prelude (1955). There were other composers in the early twentieth century who collected and augmented their native folk music and used these themes in their work. Two notable examples are Béla Bartók and Zoltán Kodály. Yet in Le Sacre du Printemps Stravinsky is once again innovating in his use of folk themes. He strips these themes to their most basic outline, melody alone, and often contorts them beyond recognition with additive notes, inversions, diminutions, and other techniques. He did this so well, in fact, that only in recent scholarship, such as in Richard Taruskin's Stravinsky and the Russian Traditions: A Biography of the Works Through Mavra ISBN 0520070992, have analysts uncovered the original source material for some of the music in The Rite. The late nineteenth century and early twentieth century was a time ripe with orchestral innovation. Composers such as Anton Bruckner and Gustav Mahler were well regarded for their skill at writing for the medium. They, in turn, were influenced by the expansion of the traditional classical orchestra by Richard Wagner through his use of large forces and unusual instruments. Stravinsky continued this Romantic trend of writing for huge orchestral forces, especially in the early ballets. But it was when he started to turn away from this tendency that he began to innovate by introducing unique combinations of instruments. For example, in L'Histoire du Soldat (A Soldier's Tale) the forces used are clarinet, bassoon, cornet, trombone, violin, double bass and Percussion instrument|percussion, a very striking combination for its time (1918). This combining of distinct timbres would become almost a cliché in post-World War II classical music. Another notable innovation of orchestral technique that can be partially attributed to Stravinsky is the exploitation of the extreme ranges of instruments. The most famous passage is the opening of the Rite of Spring where Stravinsky uses the extreme reaches of the bassoon to simulate the symbolic "awakening" of a spring morning. It must also be noted that composers such as Anton Webern, Alban Berg and Arnold Schoenberg were also exploring some of these orchestral and instrumental techniques in the early twentieth century. Yet their influence on succeeding generations of composers was equaled if not exceeded by that of Stravinsky. Erik Satie wrote an article about Igor Stravinsky, that was published in Vanity Fair (1922). Satie had met Stravinsky for the first time in 1910. Satie's attitude towards the Russian composer is marked by deference, as can be seen from the letters he wrote him in 1922, preparing for the Vanity Fair article. With a touch of irony he concluded one of these letters "I admire you: are you not the Great Stravinsky? I am but little Erik Satie." In the published article Satie argued that measuring the "greatness" of an artist by comparing him to other artists, as if speaking about some "truth," is illusory: every piece of music should be judged on its own merits, not by comparing it to the standards of other composers. That was exactly what Jean Cocteau had done, when commenting depreciatingly on Stravinsky in his 1918 Le Coq et l'Arlequin. Composer Constant Lambert (1936) described pieces such as L'Histoire du Soldat (A Soldier's Tale) as containing "essentially cold-blooded abstraction." He continues, saying that the "melodic fragments in L'Histoire du Soldat are completely meaningless themselves. They are merely successions of notes that can conveniently be divided into groups of three, five, and seven and set against other mathematical groups," and the cadenza for solo drums is "musical purity… achieved by a species of musical castration." He compares Stravinsky's choice of "the drabbest and least significant phrases" to Gertrude Stein's: "Everday they were gay there, they were regularly gay there everyday" ("Helen Furr and Georgine Skeene," 1922), "whose effect would be equally appreciated by someone with no knowledge of English whatsoever." In his book Philosophy of Modern Music (1948) Theodor Adorno calls Stravinsky "an acrobat, a civil servant, a tailor's dummy, hebephrenic, psychotic, infantile, fascist, and devoted to making money." Part of the composer's error, in Adorno's view, was his neo-classicism, but more important was his music's "pseudomorphism of painting," playing off of le temps espace (space) rather than le temps durée (duration) of Henri Bergson. "One trick characterizes all of Stravinsky's formal endeavors: the effort of his music to portray time as in a circus tableau and to present time complexes as though they were spatial. This trick, however, soon exhausts itself." His "rhythmic procedures closely resemble the schema of catatonic conditions. In certain schizophrenics, the process by which the motor apparatus becomes independent leads to infinite repetition of gestures or words, following the decay of the ego." "How are we to keep from succumbing to the irresistible need of sharing with our fellow men this joy we feel when we see come to light something that has taken form through our own actions? Thus the consummated work [composition] spreads abroad to be communicated and finally flows back toward its source. The cycle, then, is closed. And this is how music comes to reveal itself as a form of communion with our fellow man—and with the Supreme Being." ↑ Philip Glass, "Igor Stravinsky." TIME magazine "Most Influential 100" June 8, 1998, . Retrieved April 14, 2008. ↑ Ornella Volta. Satie seen through his letters. (London: Marion Boyars Ltd., 1989. ISBN 071452980X). Slonimsky, Nicolas (1953), Lexicon of Musical Invective: Critical Assaults on Composers Since Beethoven's Time. WA: University of Washington Press, 1978. ISBN 0295785799. Igor Stravinsky. Poetics of Music in the form of six lessons. (from the Charles Eliot Norton lectures delivered in 1939-1940). Harvard College, 1942. English translation by Arthur Knodell and Ingolf Dahl, preface by George Seferis: Harvard University Press, 1970, ISBN 0674678559. IMSLP - International Music Score Library Project's Stravinsky page. This page was last modified on 24 February 2018, at 22:48.